Raksha Mantri Smt Nirmala Sitharaman and Minister of Defence, Japan, Mr Itsunori Onodera exchanging memento at South Block, New Delhi on Monday, August 20, 2018. New Delhi: The Defence Minister of Japan Mr. Itsunori Onodera is on a bilateral visit to India at the invitation of the Defence Minister of India Smt Nirmala Sitharaman from 19 to 20 August 2018. The two Ministers held the annual Defence Ministerial Meeting on 20 August 2018 in Delhi. Minister Onodera also called on Prime Minister of India the same day. The Ministers noted the fact that Prime Ministers of Japan and India emphasised the significance of defence and security cooperation in enhancing the strategic partnership between the two countries in September 2017, and exchanged views and ideas in a constructive and forward-looking manner. The Ministers shared the recognition that it is important for the two countries to further strengthen defence and security cooperation under the ‘Japan-lndia Special Strategic and Global Partnership’ that aligns Japan’s ‘Free and Open Indo-Pacific Strategy’ with India’s ‘Act East Policy’ to work together in achieving common objectives. The Ministers recognised that the peace and stability of the Indian Ocean and the Pacific Ocean are crucial for ensuring the peace and prosperity of the Indo-Pacific region, and had a frank exchange of views on the current security situation in the Indo-Pacific region, including developments in the Korean Peninsula. The Ministers also welcomed the participation of the Japanese Chief of Staff, Joint Staff in the Raisina Dialogue, the flagship conference supported by the Government of India, as the first participation to the dialogue from the Defence Ministry of Japan. The Ministers reaffirmed that they have shared interests in expanding cooperation in the maritime security domain and welcomed the fact that Japan Maritime Self-Defence Force (JMSDF) and the Indian Navy are working towards the signing of the Implementing Arrangement for Deeper Cooperation between the JMSDF and the Indian Navy. With the aim of deepening bilateral cooperation in this domain, the Ministers also reaffirmed their intention to pursue cooperation in engaging with countries of the Indo-Pacific, including through their capacity building. o Annual Defence Ministerial Meeting: The Defence Minister of India will visit Japan in 2019.
o Welcoming the first official visit to India by the Japanese Chief of Staff, Joint Staff in 2018, both sides decided to organise the visit by the Chief of Staff, JMSDF to India in November 2018 and the Indian Chief of Air Staff to Japan by the end of 2018.
o Both sides will seek to realise the 7th Defence Vice Minister/Secretary level Defence Policy Dialogue and the 6th Vice Minister/Secretary level ‘2 +2’ dialogue in Tokyo in 2019. • Exchanges between the Japan Ground Self-Defence Force (JGSDF) and the Indian Army. Minister Onodera commended the fact that Indian Army personnel participated as observers in the Japan-U.S. joint bilateral HADR exercise in November 2017 to share lessons learnt from natural disaster experiences. From the perspective of reinforcing bilateral cooperation and exchanges, the Ministers also welcomed the progress made in preparing for the first-ever bilateral joint exercise in the domain of counter-terrorism between the JGSDF and the Indian Army to be held in the fall of 2018. They reaffirmed their intention to continue cooperation through conduct of exercises. • Exchanges between the Japan Maritime Self-Defence Force and the Indian Navy. The Ministers expressed satisfaction at the success of Japan-India-U.S. Trilateral Maritime Exercise MALABAR 2018 in June 2018 as well as the start of the constructive, trilateral discussion toward the next round of the exercise. The Ministers, noting the significance of bilateral training interactions, emphasised the unprecedented frequency at which JMSDF and the Indian Navy conducted port calls and joint exercises since the last Defence Ministerial Meeting, showing progress in bilateral training cooperation. The Ministers shared the view that they would pursue continuation and sophistication of bilateral joint exercises, including those in areas of anti-submarine warfare and mine-countermeasures. The Ministers welcomed the steady expansion of exchanges involving various subject matter experts in the air component, including Japan Air Self-Defence Force (JASDF) helicopter crews’ visit to India’s Sarsawa Air Force Station in December 2017. They affirmed JASDF’s participation as observers in the next round of Exercise Cope India to add further momentum to air-to-air exchanges, given the success of the 2nd Air Staff Talks in June 2018. They also expressed their intention to seek further opportunities for air-to-air cooperation through visits of Japanese and Indian air assets to each other’s air bases. The Ministers welcomed the regular exchange of students between the defence educational and research institutions of the two countries, including the National Defence College of India, and the National Institute of Defence Studies of Japan, and reaffirmed that they would continue to do so. The Ministers praised various efforts made in the field of bilateral cooperation in defence equipment and technology during the past year, including the progress made in the bilateral discussion of the 4th Joint Working Group on Defence Equipment and Technology Cooperation (JWG-DETC) in Delhi in July 2018 for identifying specific areas of cooperation. The Ministers also noted the effort made by both countries regarding the cooperation on US-2 amphibious aircraft. The Ministers welcomed the fact that constructive engagement between the Acquisition, Technology and Logistical Agency (ATLA) of Japan and the Defence Research and Development Organisation (DRDO) of India has resulted in the signing of a project arrangement between the Ministry of Defence of the Republic of India and the Ministry of Defence of Japan concerning the Cooperative Research in the Area of Unmanned Ground Vehicle (UGV) /Robotics, marking the start of the first bilateral cooperative project. The Ministers noted the efforts by relevant authorities of Japan and India in organising the visit of Japanese defence enterprises to Indian defence industries in August 2018 in order to follow up on the first-ever Japan-India Defence Industry Forum in September 2017, and to promote the interaction between public and private sectors, as well as between Japanese and Indian defence industries. The Ministers commended that such efforts contribute to the deepening of mutual understanding between the defence industries of the two countries and to the prospect of future bilateral projects. The Ministers recognised the importance of promoting defence equipment and technology cooperation through a joint effort between the public and private sectors in order to bilaterally strengthen technological capability and industrial infrastructure and shared the view that they would further develop defence equipment and technology cooperation between the two countries. Minister Sitharaman briefed Minister Onodera on the setting up of two Defence Industry Corridors in India and invited participation of Japanese enterprises. 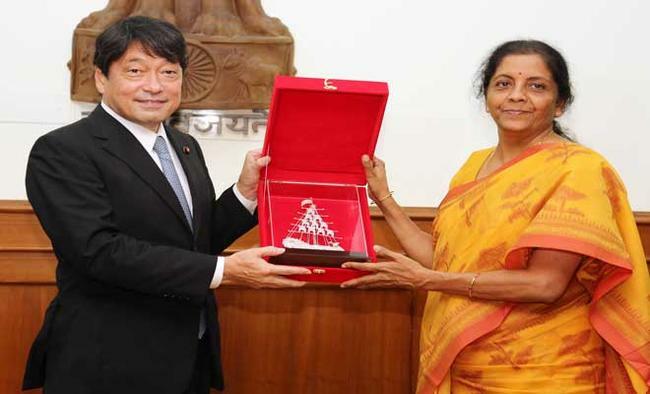 Minister Onodera appreciated the briefing.Minister Onodera thanked Minister Sitharaman for the very warm welcome and hospitality extended to him and members of the Japanese delegation during his visit to India.